A 2-year-old boy was found wandering a street in Rancho El Dorado after escaping from his babysitter's house. A father is grateful his son is alive after the 2-year-old was found alone, walking the streets of a residential area yesterday. “My son could be dead right now,” said Steven Ross, the boy’s father. Ross alleges an at-home daycare operating out of Rancho El Dorado is responsible. Ross said he dropped off his son at Olivia Merolli’s home at 10:15 a.m. Feb. 20 to attend a doctor’s appointment. When he returned two hours later to pick him up, he was gone. Merolli said she did not know the child was missing until his parent came to retrieve him from her home. Ross said when Merolli could not find his child in her home, he checked the back yard and the street surrounding the residence. With 2-year-old Jayden no where to be found, a panic-stricken Ross drove his vehicle around the block to broaden the search. Eventually Ross found an officer with the Maricopa Police Department nearby. The officer had been knocking on doors attempting to locate a lost child’s parents. That child was Jayden. Ross said he was immediately reunited with his son soon after in the care of another officer. 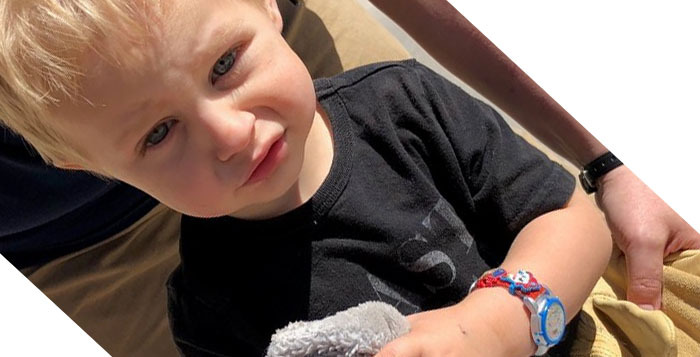 The father said police told him landscapers working in the area found Jayden wandering the street at 10:50 a.m. and had attempted to find his family before eventually alerting law enforcement. “I am so thankful to them and to Maricopa Police Department for responding to it so fast,” Ross said. Ross expressed concern regarding the number of children he said he observed under Merolli’s care — around 10 to 15. Merolli, who said she has been working in the childcare industry for 34 years, declined to comment on the specific number of children present at the time, but said the amount does vary from day-to-day because she accepts short-notice “drop-off,” or children she doesn’t typically watch on a regular schedule. She said she is not a licensed daycare provider and will continue caring for children but will cease accepting drop-offs. Merolli is not the child’s primary childcare provider, but watches him periodically as needed, according to both Ross and Merolli. Merolli said she takes full responsibility for the incident, but alleges she was told by those who know the family that Jayden has a history of escaping from his own home in the past and was not informed prior to watching the child. “I want to emphasize that Ross should have told me that he could get out the door,” she said, adding she has installed safety proofing to her door after yesterday’s incident. But Ross said those accusations are false and yesterday was the first time his child has ever been outside without a parent or guardian. Ross advises parents make sure daycare providers are licensed by the state before leaving their child with them, conduct home checks in addition to an interview, seek background and public records checks and get references from other parents as well. “Don’t make the same mistake me and my girlfriend did, do your research,” Ross said. How dare Merolli say that the 2-year old escapes. That is a cowardly comment to shift the blame from her to a 2-year old. I hope the father contacts CPS so the can close down her operation.